NYC Educator: "But Someone Has to Make War"
Really, Geoffrey Canada? 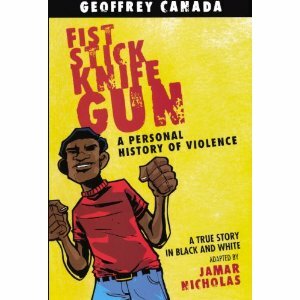 The author of Fist, Stick, Knife, Gun, who really ought to know something about the ramping up of not only violence, but rhetoric? The title of this post is a direct quote from Canada, founder of Harlem Children's Zone and big-time ed reform mucketymuck, and whose comprehensive approach to school reform brings much to appreciate. But unfortunately, his alignment with Michelle Rhee and Joel Klein hasn't done much to endear him to me, and his comments in this article from the Times about the founding of Students First NY aren't going to help. This new branch of "Students First" (which I place in quotes, as if somehow making sure that teachers are paid fairly, schools have enough seats for the children attending them, and that budgets are able to meet children's needs isn't putting students first) has formed in response to the coming mayoral election, to do combat with any candidate who might theoretically not be a complete disaster when it comes to the city's schools. Individual merit pay? Publishing teacher data? Stuffing as many students as possible in every class, since class size doesn't matter, only how "effective" the teacher is? Testing everything right down to whether students give up their seats for old ladies on the subway? (Actually, I'll take that last one. I'm "highly effective" in that department. But anyway.) Bring it on and more, they say. But, since we shouldn't be shocked that our old pals RheeKlein et al. are going to make sure they stay in the headlines even when their ally Bloomberg leaves office, let's go back to the curious case of Geoffrey Canada. The full quote from Canada is this: "Folks are genuinely looking for opportunities to make peace and not war. But someone has to make war." This is in reply to the suggestion that many charter schools and advocates are looking at their own schools and making improvements, rather than attacking others. So someone has to make war? Why? Haven't city teachers borne the brunt of years of largely failed reforms, going the last three years without a raise? Haven't kids suffered in schools without adequate chairs, books, and even toilets? Why can't we focus on making the changes in schools that all stakeholders can support, like smaller class sizes, a wider range of activities and classes to keep kids engaged with school, and keeping facilities and materials up to date? Evidently not. Canada, who, again, should know something about the perils of escalation, thinks someone has to make war. Color me disappointed with someone like Canada having a foot-in-mouth moment. On a happier note, happy spring break! Enjoy the time off. I'm certain you've earned it. I'm off to exotic climes indeed for this break and looking forward to it. So I'm leaving you in the very capable hands of NYC Educator for the coming week (except for one quick post from me on Wednesday). Go easy on him in case he has to go to darkest New Jersey.